For $25,000, Will This Custom 1996 Nissan 240SX Show You Who’s Boss? Michigan may be out this year when it comes to college football, but with today’s Kalamazoo-located custom 240SX offered up for Nice Price or Crack Pipe consideration, it’s still in the game. Let’s see if this “Boss” comes with a price that’s large but still in charge. Two Thousand and Sixteen went out not with the bang of revolution, but with the muted acquiescence of a new world order. Some things never change however, and last Friday’s LS1-rocking 2002 Chevy Blazer grabbing a 63% Crack Pipe loss seemed wholly apropos. Around here it seems no S-10 Blazer is ever deemed worth anything more than pocket lint and mocking derision. SAD! Do you remember the TV show Who’s the Boss? It featured national treasure Tony Danza as the housekeeper to Judith Light’s divorced business woman, and Alyssa Milano as Danza’s sassy daughter. That sitcom went off the air in 1992, coincidentally four years before this Nissan 240SX left its Kanda City factory. 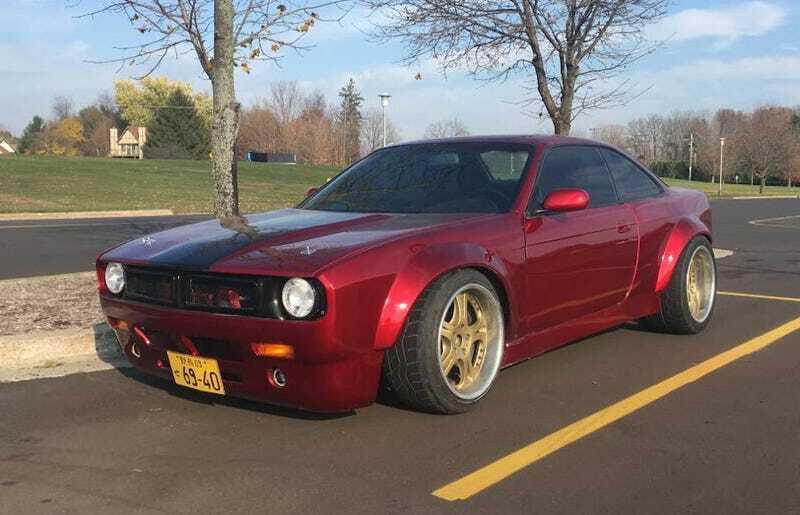 Tony Danza has been keeping steadily busy since then, and this S14 has seen some business as well, including the addition of an ultra-wide Rocket Bunny Boss kit and VH45DE DOHC V8 out of a 1995 Q45. Okay, first off let’s have a chat about that body kit. Yes, it does look like a ’70 ‘Cuda that’s been on Weight Watchers, and yes, that’s the intent. The Rocket Bunny kit adds the ‘Cuda-esque nose, fender flares, and a rear bumper-cap delete. Badassity is included at no extra cost. This car turns that up to eleven as the seller notes it was enhanced with 3-inch fender flares under its Boss-imbued arches. A candy apple paint job and uber-fat Weds Kränze Cerberus wheels mounted with stretched meat tops all that. Beneath the custom bodywork lies that aforementioned VH45 V8 that the seller says was “rebuilt to perfect oem spces.” Partnered with that is a five-speed stick out of a 300ZX Turbo. The stick that does that shifting sits between a pair of Sparcos that the seller says are “out of a Porsche race car.” Imagine the shock of the driver of that Porsche to discover his seats gone! The rest of the interior is pretty low-key. No A-pillar gauge packs or carpet to get in your way here. Are the actual gauges on speaking terms with the VH45 and gearbox? We don’t know. Mileage as well goes undisclosed, but considering the work on the car, does that even matter? At least the title is clean. The ad says that the car was built from the ground up with everything refreshed or replaced. It’s claimed to be an award-winning show car and a grocery-getter at the same time. That’s the kind of effective multi-tasking you rarely see outside of an Alton Brown fever dream. What does it cost to be so Boss? The asking price is $25,000, and I’d wager that it would be pretty tough to Boss-up another S14 to this level (eleven) for similar cash. Still, we’re here to gauge wether or not THIS one is worth that $25,000. What’s your take, does this custom Nissan look to be able to command that kind of cash? Or, is this Michigan-located monster just not that boss? Kalamazoo MI Craigslist, or go here if the ad disappears. H/T to Finn762 for the hookup! For $8,900, Does This 2002 Chevy Blazer Put The Sport In Sport Utility?